Today was Forum:NE+, a day of training for the CU leaders in our region. For these days we split the patch into 2: the real north-east and Yorkshire. We had a great day in our area, with students from all 6 of our CUs represented: Durham, Newcastle, Northumbria, Stockton, Sunderland and Teesside. It was fun, but it was also pretty hectic, and so I didn’t get any pictures of the day. 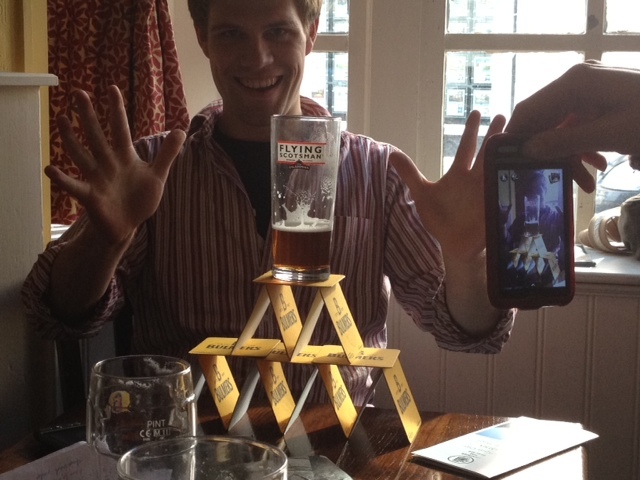 However, after all the meetings were done I went to the pub for a drink with the Relay workers (and a Relay wife), and JP decided to build a house of cards out of beermats, and then balance his pint on top. He demanded that I take a photo and then post it on my blog. I refused to acquiesce unless he built a two-layer house (mostly because it seemed more likely that this would lead to a him-spilling-his-pint-over-himself scenario). He built the house, and didn’t spill it (disappointing), but fair is fair, and here’s a photo. Also, you should know, that JP and JJ are apparently having a competition to see which of them gets the most mentions on my blog. Obviously today’s architectural feat puts JP in the lead, stay tuned to see if JJ can even it out any time soon.